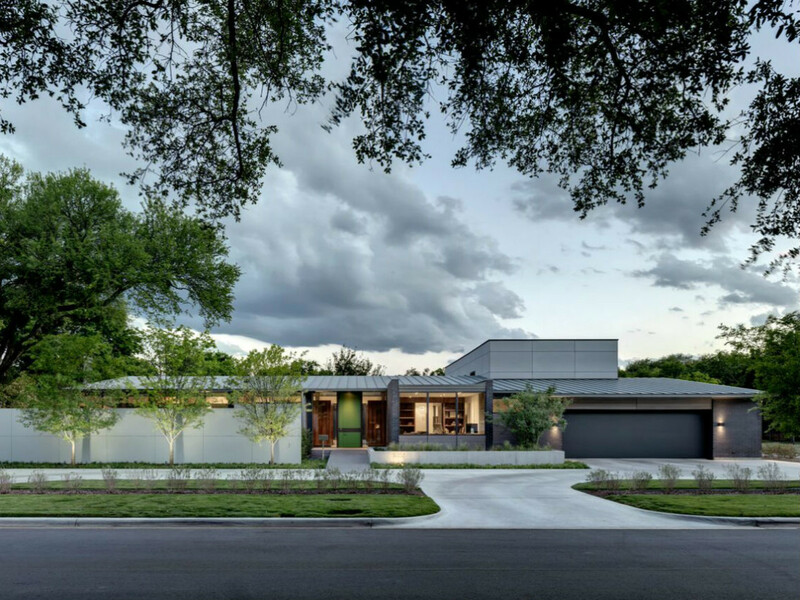 The 11th annual AIA Dallas Tour of Homes, Dallas' only citywide home tour and the area's only tour curated exclusively by architects, will be held October 28-29 from 10 am-5 pm. Seven residences are featured, including new construction and renovations, presenting design from many angles and emphasizing the importance of working with an architect to achieve a high level of creative, personal, and functional results. Over the past 11 years, the two-day tour has showcased more than 90 homes and highlighted the work of some of the city’s most talented architects and the area’s most innovative and outstanding residential design. Featured homes, including the one pictured above on Royal Crest Drive, are in neighborhoods across Dallas, including Knox/Henderson, Lakewood, Victory Park, Preston Hollow, and Lake Highlands. 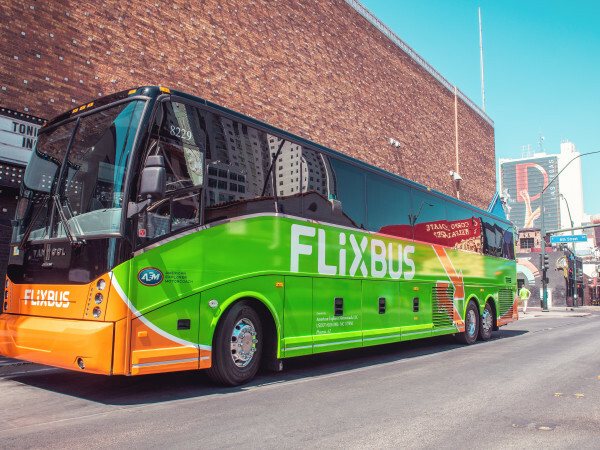 Tickets are $25 in advance and may be purchased online at hometourdallas.com. Tickets may also be purchased for $30 during the weekend of the tour at the homes themselves. Tickets to visit individual homes are $10 on the day of the tour. 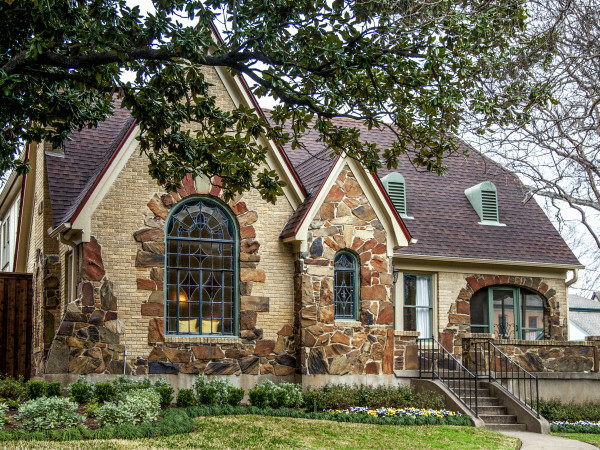 On October 23, a map and addresses for the homes will be available on hometourdallas.com. Read on to see photos and descriptions of the homes. Home Description: This 6,716-square-foot residence was designed for a busy family of five. Expansive windows take advantage of the large North Dallas lot, providing plenty of natural light to the interior spaces with a large covered patio extending the inside outdoors. The home was crafted to stand up to the additional wear and tear of not only three kids, but a wheelchair. To handle the extra wear, steel was used throughout the home. Both owners work from home, and the public spaces were planned to serve as both living and office space. The office is located near the entry so any business acquaintances need not enter further into the private realm of the house. Consideration was given to the scale of the home in relation to the neighborhood. 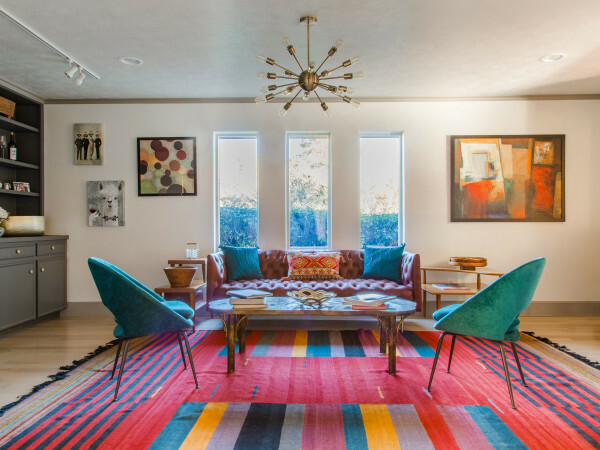 Home Description: This 7,186-square-foot Highland Park home was designed by Scott Lyons, a Dallas modernist who was a protégé of the legendary architect O’Neil Ford, FAIA. Built in the 1970s, the house remained in original condition until 2014, when the house was gutted to its structural frame. With the exception of the exterior stucco, all interior and exterior surfaces are new. A 450-square-foot studio has been added off the master suite. All door and window openings are original, but new white oak doors and windows replace the aluminum originals. Original tile flooring has been replaced by oak, and custom oak cabinets replace the original painted cabinets. A covered porch was added to the kitchen area and new under-story plantings were added under the live oak trees that surround the house. The owner’s art collection played a large role in the design of the new spaces. Much attention went into the placement and lighting of the art pieces – in particular, a large hanging sculpture in the dining room by James Surls. Sidebar: This home is exclusive to the Premiere Party, which will kick off the 2017 AIA Dallas Tour of Homes on Thursday, October 26. Premiere Party tickets are available at hometourdallas.com and include a ticket to the weekend tour. Home Description: The owner of this 4,210-square-foot ranch-style home has a passion for reusing and adapting existing homes, as opposed to simply scraping and starting from scratch. In addition to a renovation, the home received an addition, new detached pool cabana, and new detached studio and workshop. Creating a quiet gesture to the neighborhood and utilizing the entirety of the lot were high priorities. Charred cypress cladding in tandem with a simple roof form created a backdrop for a variety of native plantings toward the street. The addition of a steel and timber structure, along with expanses of glazing, transformed the compartmental space into one that was flowing and connected to the pool and landscaping. Home Description: This 2,400-square-foot townhouse is an urban response to a client downsizing from his 6,000-square-foot suburban compound featured on the 2007 AIA Dallas Tour of Homes. The task was to design an interior renovation to an existing masonry, steel, and wood structured townhouse from the mid-90s, which was located in a desirable, secluded urban location, but with an ill-suited floor plan and finishes. Views to the surrounding urban sprawl were limited, focusing on downtown views and the newly designed garden. The design was about restraint: room arrangement and flow were streamlined; material and color palettes limited; interior furnishings selected and arranged with precision; and lighting designed and controlled. The design was intended to create a comfortable dwelling suited to the client's current lifestyle. 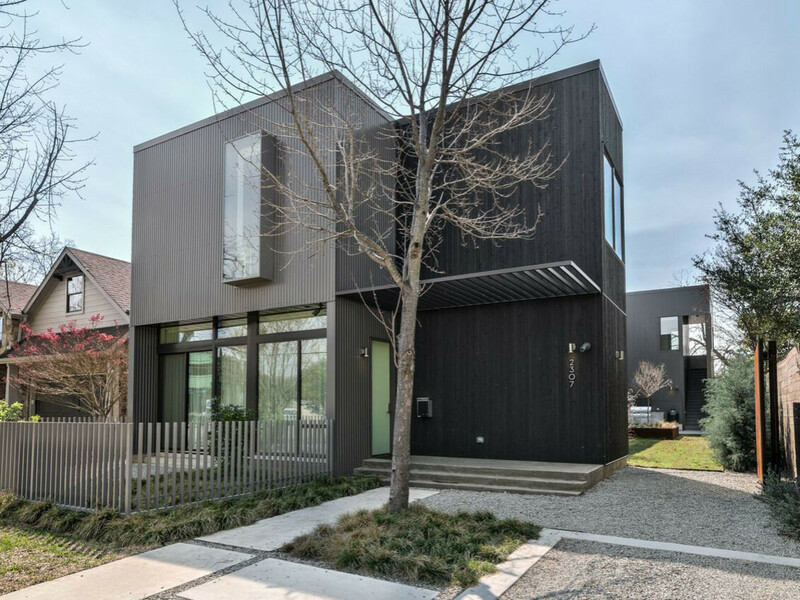 The resulting residence is a restrained contemporary home inserted into an existing urban structure, and is a successful example of architect and client working together to select, design, and renovate an existing building to fulfill the homeowner’s evolving needs. 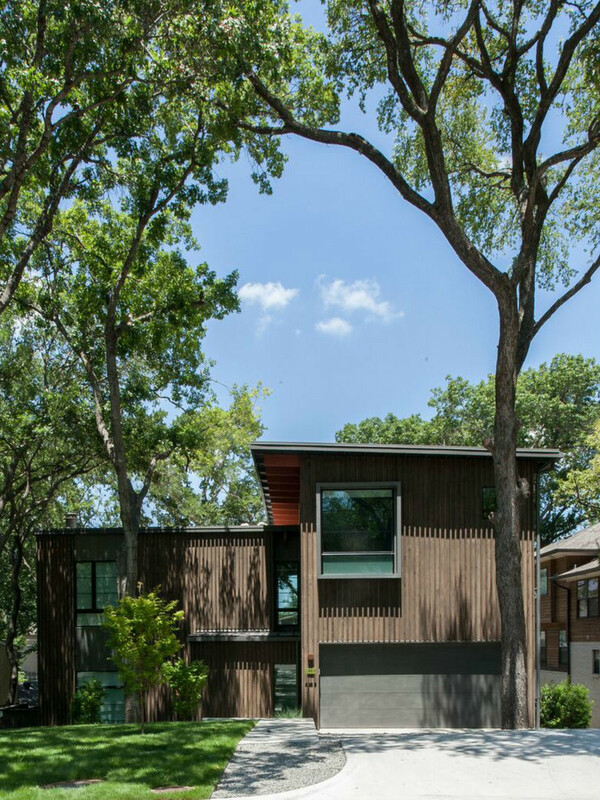 Home Description: This project began as a speculative, single-family project on a long, deep lot in Dallas’ Knox Henderson neighborhood. The parameters were to design a highly efficient and cost-effective modern home that connects indoor and outdoor spaces. The scale of the project was also critical, in that the house had to fit well within the context of the mostly one-story neighborhood. The lot was initially divided into two halves by placing the house on one side, and a long, interior garden space for outdoor gatherings on the other. The house was divided into two main volumes linked by a screen porch and an upper deck. The outdoor spaces of the screen porch and upper deck act as the joint between the front volume and the back volume of the house. Taking the massing of the project and extruding voids to create outdoor spaces further reduces the scale of the project, and allows for natural light to enter. A charcoal gray, mini rib metal siding was chosen to further incorporate the home into the neighborhood. Black-stained, cedar wood siding was used to provide contrast and depth to the main structure. The resulting design carves out a comfortable, linear garden space enclosed by the two-story home. This 6,000-square-foot contemporary U-shaped home in Preston Hollow is centered around a majestic oak tree. Mixed materials of Brazilian teak and natural split-faced stone dress the exterior with soothing textures and tones. The floor plan highlights the transition between large, open public spaces and private nooks and suite retreats. In a nod to German Minimalism, the kitchen is constructed of white back-painted glass seamless cabinets and bronze mirrors. This expansive space opens to a great room and dining area with built-in dry bar. Along the street-facing section is a "bridge" element in which a wood slatted section of the home is suspended over a dry creek bed that runs through the grounds. Floor to ceiling windows highlight the custom-designed and fabricated floating stair within the "bridge." 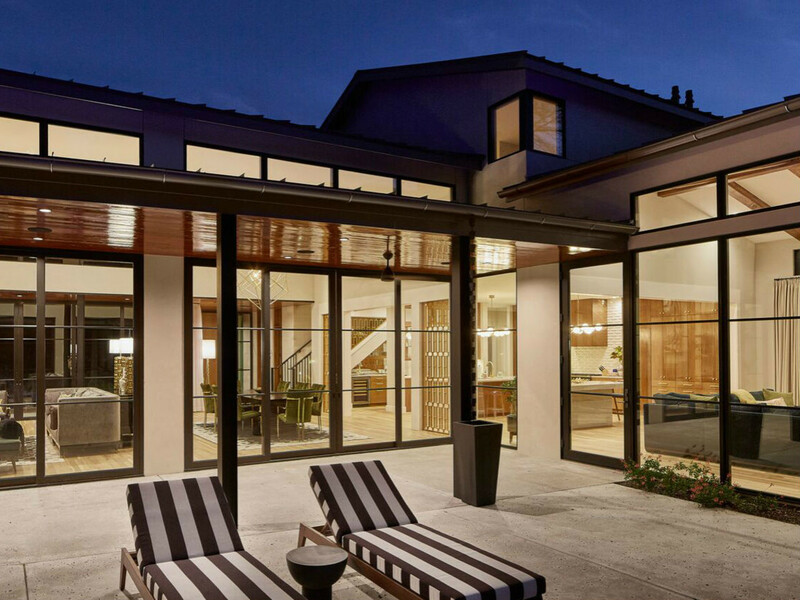 Repeating throughout the home are large, expansive custom storefront windows, as well as curtain wall systems to maximize natural light, which combine to panoramic views of the backyard and modern art within. This 6,000-square-foot contemporary U-shaped home in Preston Hollow is centered around a majestic oak tree. Mixed materials of Brazilian teak and natural split-faced stone dress the exterior with soothing textures and tones. The floor plan highlights the transition between large, open public spaces and private nooks and suite retreats. In a nod to German Minimalism, the kitchen is constructed of white back-painted glass seamless cabinets and bronze mirrors. This expansive space opens to a great room and dining area with built-in dry bar. Along the street-facing section is a "bridge" element in which a wood slatted section of the home is suspended over a dry creek bed that runs through the grounds. Floor to ceiling windows highlight the custom-designed and fabricated floating stair within the "bridge." 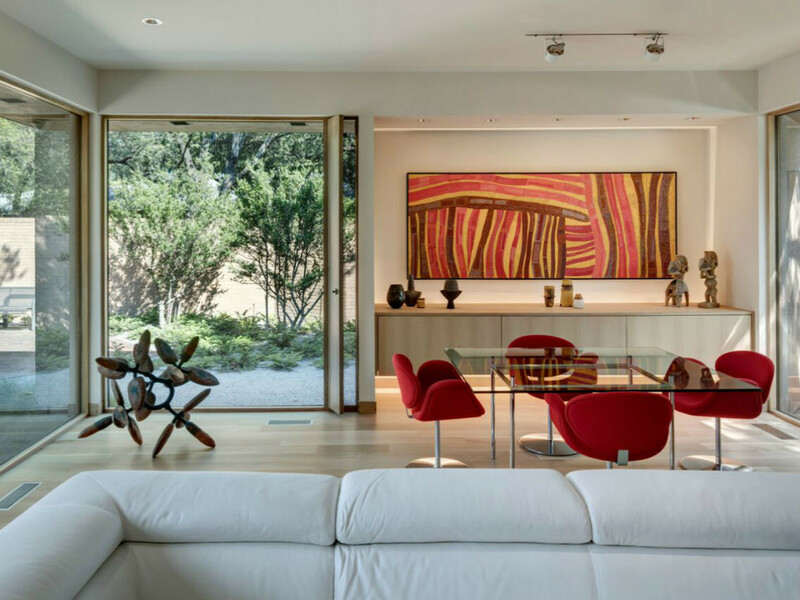 Repeating throughout the home are large, expansive custom storefront windows, as well as curtain wall systems to maximize natural light, which combine to panoramic views of the backyard and modern art within. 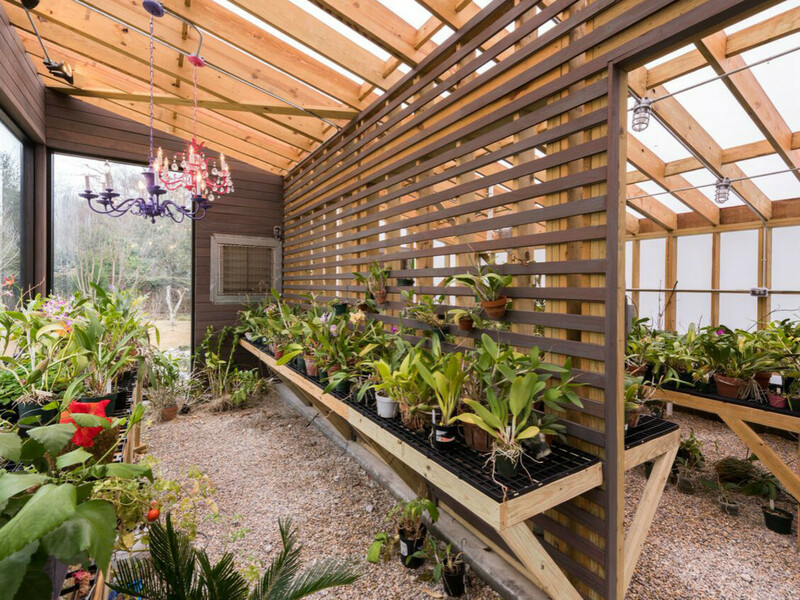 A custom green house, matching the exterior of the main house, adds elegant charm to the sprawling grounds. A large pond with a water feature wraps from the river rocks around to the master suite and its private terrace. The home boasts several patios and outdoor living spaces, making it perfect for both entertaining and relaxing. 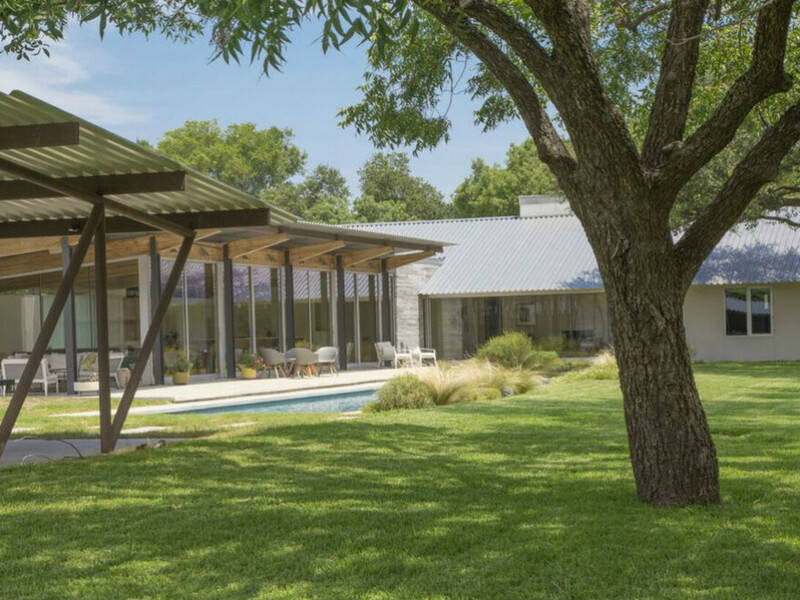 Home Description: This 3,160-square-foot residence is located on a sloping site, nestled between existing cedar, elm, and oak trees in the White Rock Valley neighborhood north of White Rock Lake. The home was designed for a family of five who previously lived in a midcentury Ju-Nel house. The owners enjoyed the openness to the outdoor spaces and natural materials of the house, but wished to create a home with more volume, better separation between bedrooms and living spaces, and a more functional kitchen. The home was designed vertically around a central staircase, with each landing featuring a distinct zone in order to create separation of space. The public spaces are located on the first level, opening directly to the outdoor living areas in the rear yard. 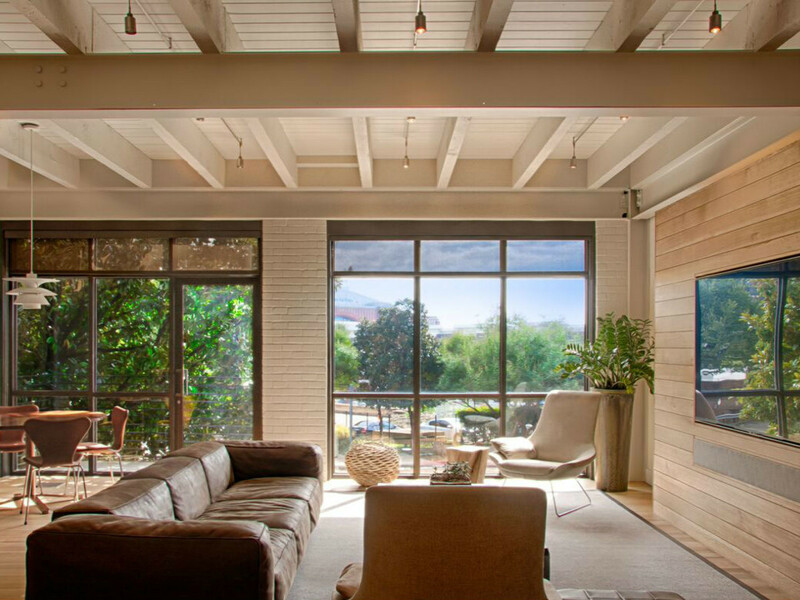 The living room is highlighted with a 14-foot high ceiling. The garage sits elevated half a level above the living room but lower than the street, while the playroom, office, and utility room are located on the second floor. The exterior of the home is cladded in darkly stained cedar siding and zinc-grip metal panels to make the facade recessive. Deep, rough sawn battens are installed on the north and south facades to create a dynamic exterior texture pattern that becomes a rich backdrop for the tree shadows. Through the use of carefully selected exterior materials, the house reduces its scale to contextually blend with the surrounding environment. Home Description: New-construction home was designed to balance a modern aesthetic with warm, natural materials and a strong connection to the outdoors. The home is positioned on a large, heavily treed, corner lot in the Forest Hills neighborhood of East Dallas. The massing and window-to-wall ratio was carefully designed for the lot and to compliment the adjacent surroundings. At 6,313 square feet, the home was designed for a family who wanted to focus on entertaining and everyday comfortable living. An open plan boasts floor-to-ceiling glass, clerestory, large spaces with high ceilings, walls of sliding glass doors, and three outdoor spaces. Home boasts high-end finishes, custom furnishings and draperies, and commissioned art. New-construction home was designed to balance a modern aesthetic with warm, natural materials and a strong connection to the outdoors. The home is positioned on a large, heavily treed, corner lot in the Forest Hills neighborhood of East Dallas. The massing and window-to-wall ratio was carefully designed for the lot and to compliment the adjacent surroundings. At 6,313 square feet, the home was designed for a family who wanted to focus on entertaining and everyday comfortable living. An open plan boasts floor-to-ceiling glass, clerestory, large spaces with high ceilings, walls of sliding glass doors, and three outdoor spaces. Home boasts high-end finishes, custom furnishings and draperies, and commissioned art. Home Description:New-construction home was designed to balance a modern aesthetic with warm, natural materials and a strong connection to the outdoors. The home is positioned on a large, heavily treed, corner lot in the Forest Hills neighborhood of East Dallas. The massing and window-to-wall ratio was carefully designed for the lot and to compliment the adjacent surroundings. At 6,313 square feet, the home was designed for a family who wanted to focus on entertaining and everyday comfortable living. An open plan boasts floor-to-ceiling glass, clerestory, large spaces with high ceilings, walls of sliding glass doors, and three outdoor spaces. Home boasts high-end finishes, custom furnishings and draperies, and commissioned art.